The efficiency of getting around by bike has made cycling a popular pursuit of city life. More recently, biking and street style have come together to form an entire spectrum of urban self-expression. From gritty messengers to tweed-sporting bankers, from Pashley princesses to high-tech roadies, cycle chic is everywhere you look. 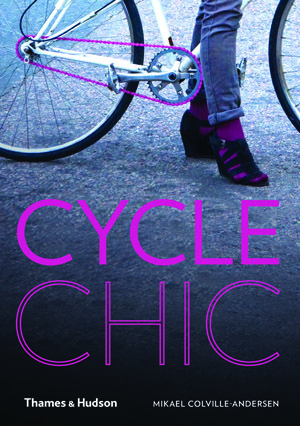 This colorful compendium offers snapshots from around the world of everyday riders who are redefining bike fashion and emphasizing the accessibility—and fun—of city cycling. Targeted at the style-conscious of all stripes, this ingenious collection presents charismatic combinations of individual style and practical function. The fun photos by Colville-Andersen and a few other photographers flaunt the beautiful people of the urban bicycling world. Mikael Colville-Andersen is the founder of Copenhagenize, a website and consultancy established to advise governments and policymakers on the importance of urban cycling, and the cycling fashion blog Copenhagen Cycle Chic. He lives and cycles in Denmark.